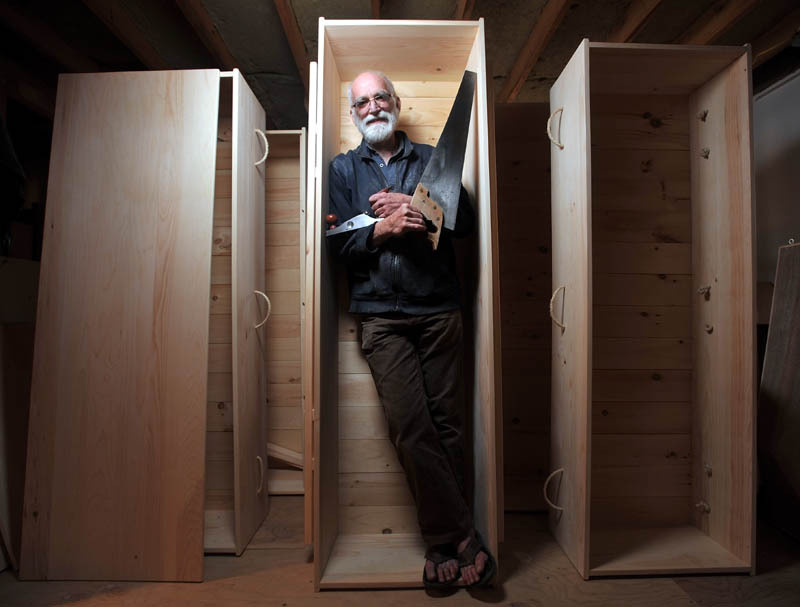 Natural-burial and home-funeral advocate Chuck Lakin, a woodworker from Waterville who had organized the 9 a.m. workshop, said he was disappointed that his planned event did not materialize, but he added that he understands. WATERVILLE — Americans are afraid of death. That’s probably why nobody signed up for Saturday’s scheduled make-your-own-coffin workshop at Barrels, in downtown Waterville. “Americans are really good at ignoring the fact that they’re going to die,” Lakin said from his home workshop on Barnet Street. “They don’t want to talk about it because most people have never been in a room with a dead person that wasn’t embalmed and sitting in a funeral home. Lakin, 67, said he had planned to walk people through the process of building a coffin Saturday morning. He was going to hold the workshop with fellow natural-burial enthusiast Cam Weaver, of Mount Vernon. Lakin said Barrels owner David Gulak told him there had been a lot of interest in the workshop. A lot of people had mentioned it over the past week or so. Nobody signed up, however, and the event was canceled. Lakin is a graduate of the U.S. Naval Academy at Annapolis who later earned a master’s degree in library science and served as the Colby College reference librarian for 22 years. He said he got started building wooden coffins when his woodworking interests merged with his belief in natural burials and his work as a Hospice volunteer. Lakin makes four different models of pine coffins, constructed with wooden pegs and wooden or rope handles — making the entire box biodegradable. He said a pine coffin buried three feet in the earth will degrade within a year. He said he can teach someone to assemble a pine coffin in four or five hours. Lakin said he emphasizes funeral planning in adult education classes he teaches. He said it is important to understand funeral choices and to plan ahead with legal papers all in order, writing down and discussing what you want to have happen to your body after your death. The discussion encompasses home funerals, green cemeteries and natural burial. He said he intends to conduct a workshop on making your own coffin in the coming months. As was learned this past week at the Boston Marathon, Lakin said, you never know when you are going to die, so it’s best to be prepared.